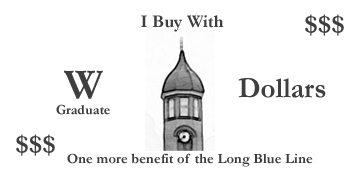 Recently, I’ve been designing money — not real money and not Monopoly Money, but W Dollars to help show the economic impact MUW has on its local community and state. The idea is that any time someone from the W spends money, they should give a W Dollar with their payment: that might be a purchase in a store, gas station, or restaurant, or it might be for paying the rent or other bills. Students, faculty, and staff live in the area and we spend money here. We also save money, and could include a W Dollar when we make a deposit or put a W Dollar in the offering plate at Church or when we make a donation to a charity. If MUW is merged, there may be a campus in Columbus, but many of the students and faculty will have to move — either to Starkville or even further away, depending on what happens to our jobs or where we decide to go to school. These dollars won’t be spent in our community if we aren’t here. The university itself brings about $17 million in state money to the area, much of which gets spent locally. In addition to the state appropriation, students pay tuition, we receive grants, and alums and other donors contribute to scholarships and the general fund. Futhermore, MUW alumns are leaders in their fields and add to the economic impact to the state. Many attribute their success to the education they received at MUW. MUW Graduate Dollars honor this aspect of MUW’s legacy. For those who would like to print their own W Dollars, here are two files with 6 bills per page (please print front and back).